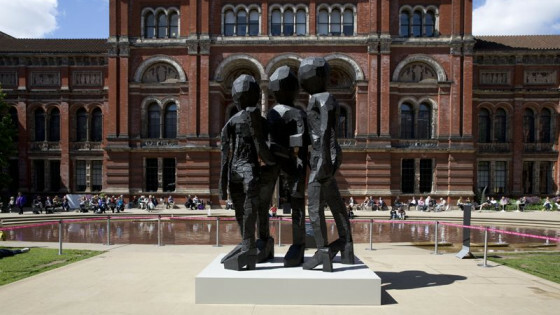 Georg Baselitz’s biggest bronze work made to date at the V&A. At times a simple looking installation can be the most challenging. Georg Baselitz’s three-figure bronze sculpture stands over 3.5 metres tall and is a considerable weight requiring specialist lifting equipment that only Mtec have. After carefully assessing all access points, we decided that an overnight install through the museum would have the least impact on both the public and the surrounding area. Obviously our planning and measurements had to be spot on, but the project management team did a fabulous job and we made it through the museum and entrance to the gardens… sometimes with millimetres to spare. Untitled (2013) by Georg Baselitz will be on display in the V&A John Madejski Garden for free, 15 June – 8 September 2013.